Home repair was a big part of my childhood. Yes, my family would mobilize each summer and remodel or fix up myriad aspects of our small ranch style house. Much of this remodeling was completely unneeded, it was sort of my parents’ hobby. One day my mother got the notion that the huge, six foot long picture window in the living room didn’t let in enough sunlight, so we installed a skylight in the roof. Once my dad picked up a set of patio doors cheap at an auction, so a wall was knocked down in our kitchen and we put in patio doors not ten feet from an existing doorway. All of a sudden carpets became unattractive, so my parents tore them up and put in a hardwood floor. And as for paint jobs, lets just say that something was always being painted. As for the yard, something was always being planted, trimmed, moved, cleaned. My parents are very kinetic people, they are constantly in motion. I don’t think I’ve ever seen them rest. My parents could never just sit still and enjoy their creation. No, they were always tinkering, repairing, improving, replacing, installing something on that poor house, and just when they couldn’t find anything more to remodel they moved and started all over again. Likewise, my childhood was full of doing things. I can hardly remember a single day where everybody in my family just hung out, relaxed, and accomplished nothing. Sure, there was lots of play — lots of it — but it was organized and mobilized play that included everybody and anybody we could find. My family did things together. My memories of growing up are overwhelmingly good. There was something in these good memories that I wanted to share with my daughter. There was something about how my family was constantly mobilized in whatever projects we were engaged in that I found myself missing recently. There was just something that I’ve been raised to view as “normal” that has been vacant from my life for the past 14+ years that I’ve been traveling. My daughter is now four years old, and for some reason I got the urge to give her a taste of what my childhood was like. So when I was presented with the opportunity to mobilize my family around a home repair project, I took it. Like I’ve written before, these opportunities are rare for the traveler. I’m part of a profession that just doesn’t take responsibility for painting walls, fixing appliances, or remodeling houses — unless, of course, we’re employed to do so. When something in the rooms we rent breaks we call someone else to take care of it. It’s not our problem. If that doesn’t work we just leave and rent another room somewhere else where things work. This is one of the benefits of this lifestyle. But I fully severed myself away from this advantage in Xiamen. I moved into an apartment that needed a massive amount of work. We signed an agreement with the landlord — who is in Beijing and completely out of the picture (a good thing) — that we would take full responsibility for fixing the place in return for a $65 monthly reduction in rent. As it has turned out, the landlord clearly got the better end of the deal. I thought moving my family into a place that would require us to all work together in order to fix up and make livable would be a good project that would promote bonding or something like that. I thought it would be a novel change of pace. I thought it would give my daughter some memories other than packing and unpacking her bags. My assumptions were clearly naive. My nuclear family is not remotely like the one I grew up in. I really don’t give a crap about having a nice place to live in. My wife wants a really nice place that requires little work. My kid just wants to ride her bicycle. I just want to travel, investigate intrigues, and work. My wife just wants to sit at some cafe drinking some fancy drink playing Sudoku. All my kid wants is to be invited over to one of her classmate’s homes. None of us have any real interest in fixing up an apartment or in building a home to our own preferences. We’ve traveled too long to just snap out of expecting the privileges of the open road. The situation that I’m in now is what happens when people don’t respect the parameters of their lives and make a play at getting it all. I tried to have it, and it just doesn’t work that way. There are advantages and disadvantages to every lifestyle. If we were going to turn into sedentary people and live in Xiamen long term and owned our apartment then pumping money into it and making it exactly how we want would be in keeping with that kind of life. But for people with the mindset of travelers, fixing up some guy’s house to live in temporarily just seems like a chore of diminishing returns. If you live within the bounds of travel and you can engineer life to the highest; live within the bounds of being sedentary and I believe you can do the same. 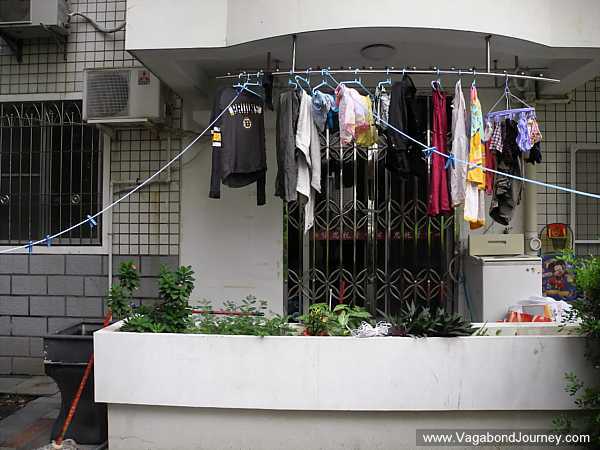 Mix the two and you end up in Xiamen with a wife that moans, “This place is a dump, we live in a dump, I can’t believe we moved into this dump,” over and over and over again. On top of this, the place seems to be crumbling right before us, the more we fix the more that seems to break. My wife is right, the place is a dump. Almost as soon as we moved in the toilet broke and then started leaking, the hot water heater croaked, one of the air conditioners decided to stopped working, and my wife just informed me that she busted the handle off the outdoor sink. To replace these things will cost more than it’s worth to us to keep living in Xiamen, but to repair them will just add to this major annoyance caused by my drive to relive some estranged episodes of my childhood. It is looking like this home repair move may have been a mistake, but in hardship is the making of memories. That’s what we’re after here, right? Good god! Sounds like you need a big bottle of Jack Daniels!! Paint slow!! For sure 🙂 Or some good Caribbean rum mixed in coconut juice.